Jose and I had the opportunity to attend a special meeting at the New Braunfels Public Library last night to get us up to speed on what is happening with the New Braunfels Puppy Playland Dog Park. Deric Garza wrote an awesome article summarizing the meeting. Read it here. This entire project is the brainchild of Audie Gibson who has put her heart and soul into raising funds to get this thing up and running. She put out a few words regarding the meeting and they can be read here. While we are at it, I would also like to give mad props to Brooke Heithoff who has tirelessly worked with Audie getting all these fundraisers going. One of the big questions we left the meeting with last night was, “How can a dog park benefit the entire community of New Braunfels?” There is no question that we are pet friendly town. Just visit the Farmers Market on any given Saturday morning and you’ll see dogs everywhere. We have several restaurants and bars downtown with patios that are also pet-friendly… not to mention the hotels and campgrounds that allow tourist pets to visit. Dogs love our rivers, too! Just this morning while listening to our local radio station 92.1 KNBT, I heard about a program our library is offering called “Food for Fines” where they will forgive overdue fines if you bring in donations of non-perishable food items, including dog food that will be donated to the New Braunfels Area Humane Society …but what about the people in our community that don’t have pets? How can New Braunfels as a whole benefit? Did you know the man power and resources needed to respond to the massive number of pets that are surrendered to shelters is emotionally, physically, and financially exhausting? It’s a sad fact that the 2nd most common reason that dogs are surrendered to shelters and rescues is for their behavior. Dog parks provide the venue and opportunity for dogs to get vital exercise and socialization they need, which are two major factors in reducing behavior issues. This very subject was brought up at the City Council meeting last night. We were unable to attend as we were at the dog park meeting, but our friend and candidate for Mayor of New Braunfels, Greg Gallagher was there and filled us in. There is always discussion about our local Humane Society being over-burdened and questions about the amount of animals being euthanized. Excellent source of dog-dog social interaction, dog-people social interaction, people-people social interaction, dog-oriented people can meet and interact, doggy play dates can be arranged, perfect source of off-leash exercise for active dogs, dog parks allow dogs to get adequate physical and mental exercise thereby lessening destructive and annoying behaviors in general which can benefit society as a whole, good opportunity for owners to learn about dogs through observation and provides the opportunity to learn from more experienced owners, opportunity for well-mannered-dog advocates to demonstrate how they turned their dog into a well-mannered dogs, dog parks which are designed for dogs only lessen the chance of owners letting their dogs off-leash in on-leash parks, promotes responsible pet-ownership, more likely to encounter people who enjoy dogs, and could provide location for community dog activities. One of my favorite advantages to having a community dog park is that it provides elderly and disabled owners with an accessible place to exercise their dogs, giving them both a better quality of life! Cities that have dog parks note that there are economic advantages to a dog park for the community and the community is perceived more favorably. Dog parks help bring people into the community and attract travelers and vacationers. Communities that have dog parks note higher licensing rates for dogs, more appropriate use of non-dog park areas in other parks, and better fitness for families and their dogs. There is no doubt that dog owners deserve to share in the “park pie” with other special use groups like baseball, soccer and tennis clubs. The recognized use of city and county maintained dog parks is growing at an amazing rate around the country, and these parks can provide an excellent venue for providing information on low cost spay/neuter and vaccination clinics, the microchip ID, dog training, and other information related to keeping canines happy and healthy. Dogs contribute immeasurably to their family’s quality of life, thus helping to foster a sense of community for everyone. 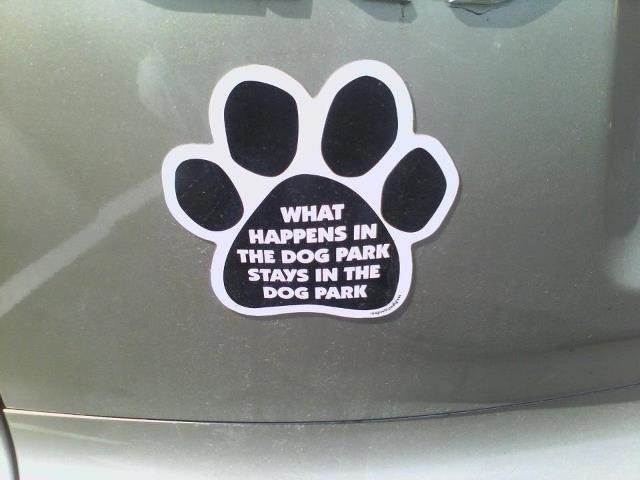 Making dog parks a priority creates positive community spirit.